Vintage stamps are a wonderful addition to your wedding invitation suite. There are many options for beautiful stamps that are not vintage, but if you are a fan of the vintage postage stamp look you’ll want to read on, especially If you aren’t hiring someone to do your invitations or envelopes for you. Below I’ve listed some tips for those who are wanting to add vintage postage stamps to their invites. This tip really applies to any couple mailing their own invitation suites. 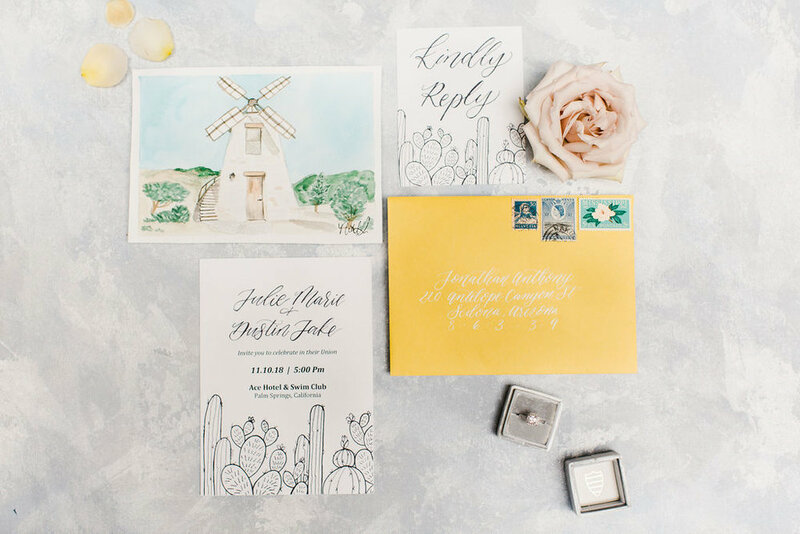 You’ll need to know exactly how much postage you’ll need for your wedding invitations (keep in mind, if you are mailing them internationally you’ll need to look at each postage rate for the country it is being mailed to). The best way to do this is to put together your entire invitation suite, which typically consists of: an invitation, an RSVP, a small envelope for the RSVP and a large envelope to fit all the elements inside. Now take this down to your local USPS office and have them weigh it and tell you how much postage you’ll need. DISCLAIMER: One of the biggest frustrations with the post office is that sometimes they can be inconsistent…. I know what you are thinking, how could that be? Well it happens! So I recommend getting your invitation weighed at 2 post offices. You’ll need to find a company that sells unused vintage postage stamps. My favorite vendor for this is The Little Postage House. She has a great collection and she also has curated sets of vintage stamps to makes things a lot easier if you aren’t wanting to curate your own. Otherwise, if you don’t select a set, you are going to have to pick each stamp for your collection and make sure all stamps add up to the postage you’ll need (which might be something you want to do if you are feeling extra adventurous!). When letters get sent through the mail, they typically go through a machine that “cancels” the postage, so that the postage cannot be used again. However, if you are nervous that the machine may be a little too harsh for your wedding invitations, you can ask that your invitations be “Hand Cancelled”. The postage stamps will be hand stamped instead of sent through the machine. Make sure to check with your local post office first to make sure hand cancelling is something they offer. You’ll want to know how much space those vintage postage stamps are going to need on your envelope before you start addressing. Otherwise you are going to potentially run into the problem of not having enough space for the postage stamps. What I like to do is create a guide with one set of the postage stamps. I lay the postage stamps out on 1 envelope exactly how I want them to look on all the envelopes, then I cut right along the edges of all the stamps to create a guide that I will put on top of each envelope before I start writing the address. This ensures that I leave the exact amount of space I’ll need for my postage stamps when the time comes to apply them. Vintage postage stamps will adhere just fine by gluing them. I like to use a clear glue stick. Since you’ll most likely be adhering 4-5 stamps per envelope you won’t want to lick hundreds of stamps… plus yuck! Haha! I hope these tips are helpful! Adding vintage stamps to your invitation suite makes them a little more special and I think your guests will agree!